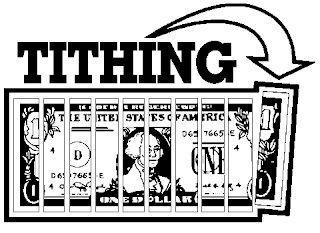 Tithing | Wir sind bettler. Hoc est verum. *disclaimer* this is not meant to be a legal study of how much particular we should give or not give, but an article to challenge our thinking and attitudes. Now a quick word before I get to my main point. With out getting in a huge word/verse study in the Bible, I would argue that we Christians are first called to give both of our time and money to the Church, and second that it should come from our heart and desire not from the law. 10% tithe is a good basic guideline, however I believe that the N.T Christian is called to give what he can, out of gratitude, joy, and a vision for Christ’s ministry on earth. For many of us this should be well over 10% of our money, not mentioning our time and talents. God’s Church and our family cannot grow, or fulfill its calling of God without people giving of their time and money to it. I have to check my heart on this too. Since I too have many times withheld money and time from God. Like everyone sometimes I am not grateful nor trusting of God, so I horde and keep from God what I can and should give. How many of us are ungrateful, and would rather spend our excess on ourselves than on God’s kingdom? What will you say to God when you have made millions (because of His blessing) and yet have given none or very little to Him? How many of us are so distrustful of God that we put away money and other investments for our well-being, security, and retirement thinking that we can secure our own future, rather than trusting in God for provision, and putting away money and other things because its the wise stewardship thing to do? Should we not have the view of our money and future that we first trust God with it and spend or save it for His glory, our good, and while using wisdom and not greed or fear? Saving, increasing wealth, and investments are all wise things a good steward should do, however its all about the attitude while doing so. How many of us do not think high enough of the Church’s (Christ’s) work that we do not give even of our time for it? Lets be practical, the Church does need our money and time to function, its really that simple. God uses His people to grow His church and to do His work. It requires money and time, and He doesn’t just create money in Heaven and rain it down on us. Most work done on Earth is done in through physical means not miracles, and through God’s people. I am not saying that God wants the rich to make themselves poor (maybe He does for some, He did tell the rich young ruler to sell everything, I think it all depends on your attitude and who you are making your god). I am not saying that God wants the poor to make themselves poorer (perhaps there is something they can give to God besides their money). Everyone should use wisdom when giving and not give what they don’t have (using credit). I am not saying that God doesn’t want us to enjoy things that He has given us, that we cannot buy something new, or that we must give any excess to Him. Its more of an attitude thing. If you haven’t given anything to God and yet feel ok buying the newest sports car…and you call yourself a Christian…well check your heart brother. I am not saying that we should test God, by giving every thing we have away foolishly testing to see if God will bless us. If you jump out of an airplane at 10,000 ft without a parachute, trusting that God will keep you alive when you hit, well you might be disappointed to know that it was at that moment God destined you to meet Him face to face. Same if you give all your food away trusting that God will feed you, you might be surprised when you starve. We are told not to test God and not to be foolish. He might save you, but regardless you were not pleasing Him with your actions. However, we should trust God to take care of us and to meet are needs and even our desires if He so is pleased to. The greedy don’t please God, the distrustful don’t please God, and the unwise don’t please God. Those who are thankful, selfless, wise, and trust God with their time and money, who give out of gratitude and joy, please God. Pleasing God requires us to think, study the Bible, practice what we learn, fight our flesh, trust God, over come sin, and sacrifice our bodies. God requires our righteousness to surpass that of the Pharisees, luckily we have Christ to be our righteousness before God and the Holy Spirit to help sanctify us, but this doesn’t mean we shouldn’t be growing towards holiness to the degree God is Holy. We all remember that everything we have comes from God. Our money is His, our time is His, everything. We all remember God’s Love and Sacrifice for us. We diligently plan out our budget and include giving to God. We live comfortably in moderation, if possible, while checking our pride and what we are trusting in. We care enough about God’s work and kingdom as to sacrifice time and money for it, and that we do it joyfully. We constantly thank God for everything we have and hold on to it loosely enough so as to be ok if God takes it all from us. We trust in God and not in this life. Lets all check our hearts and see how much we really have been changed by God’s love and grace towards us, and see how much we are laying up treasures here on Earth and not in Heaven. This entry was posted in Church, Life Philosophy, Religion on January 13, 2009 by coramdeo.